For good clean fun, there's nothing like a wake. 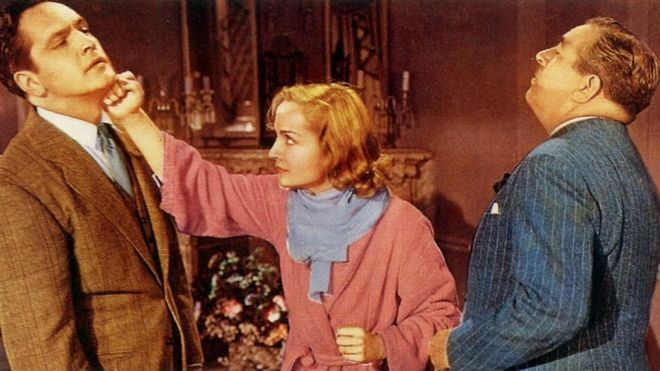 The legacy of 1937 screwball satire Nothing Sacred is an unexpectedly tragic one: it became star Carole Lombard’s only appearance in a colour film, released five years before she famously perished in a plane crash at 33. 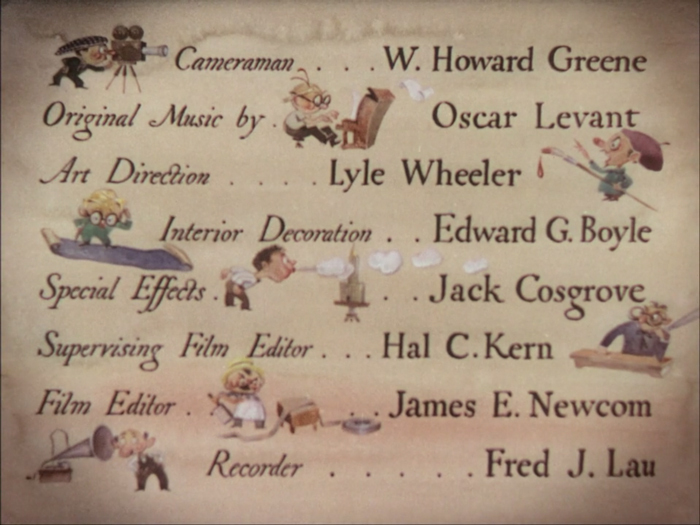 But it is also the only film credit of Sam Berman, celebrity caricaturist and the film’s title designer. Berman’s work here is immediately eye-catching. 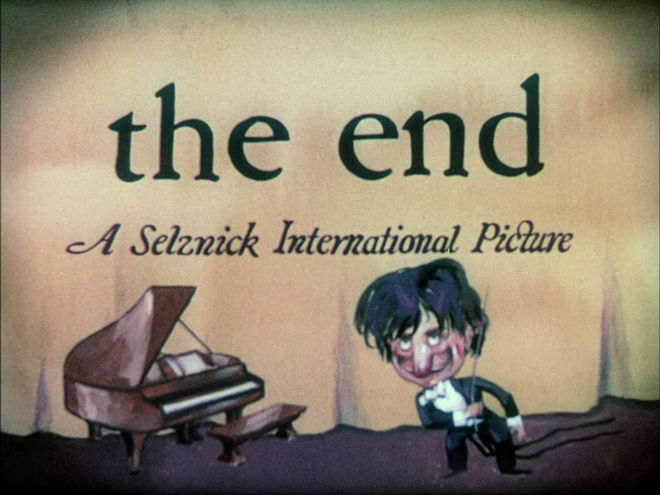 The first frame begins incongruously enough, with an in-camera shot of a hand-painted title card propped up on a small easel, informing us that Nothing Sacred is a Selznick production. 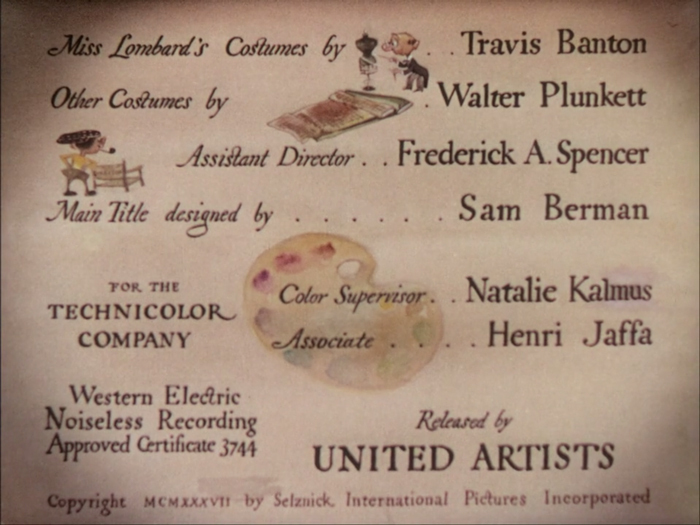 That card is flicked aside and another one set in its place, emblazoned with Lombard’s name. 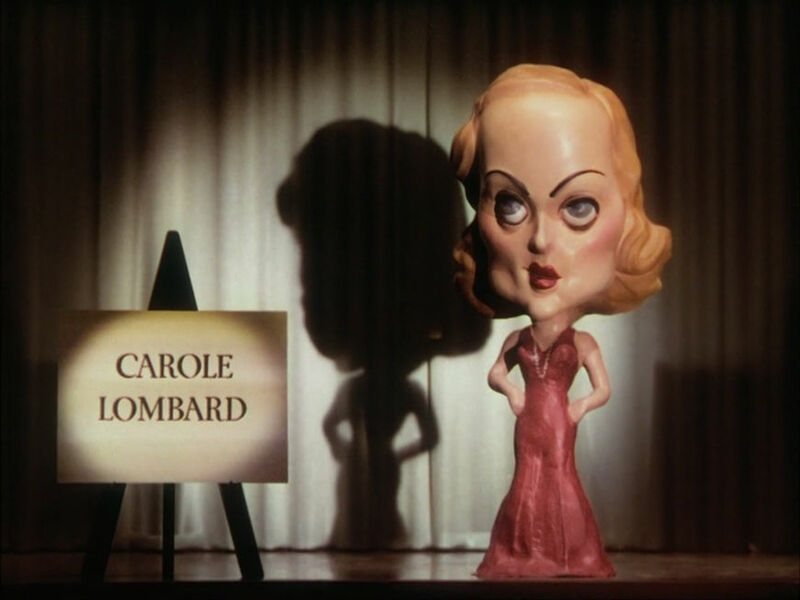 Suddenly, the camera pulls back to reveal a sculpture of Lombard standing next to the card; a caricature that is nearly grotesque in its exaggeration of the actress’s high forehead, sharp cheekbones, and pencil-thin arched eyebrows. 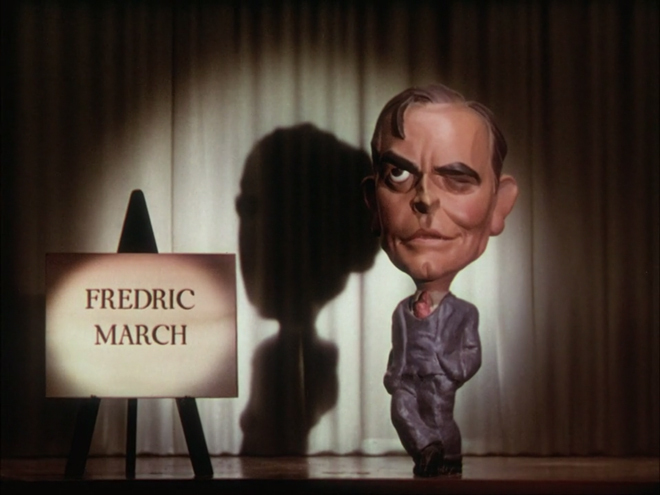 The camera pans over to another sculpture, this time of the squared jaw and cleft chin of Fredric March. 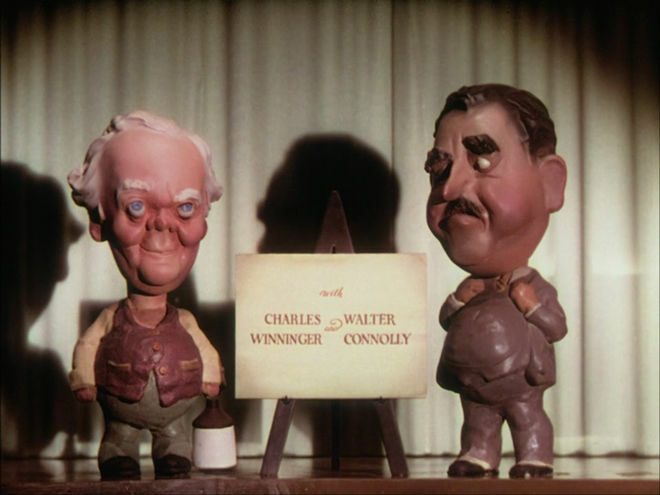 Supporting players Charles Winninger and Walter Connolly each get their own caricatured figures, their bodies accentuated and made rotund. The remaining title cards list the rest of the cast and crew, embellished with illustrations of the production crew – likely artist’s renditions rather than straight caricatures as evidenced by the credit for composer Oscar Levant, whose bespectacled cartoon counterpart looks nothing like his distinctive hang-dog face. 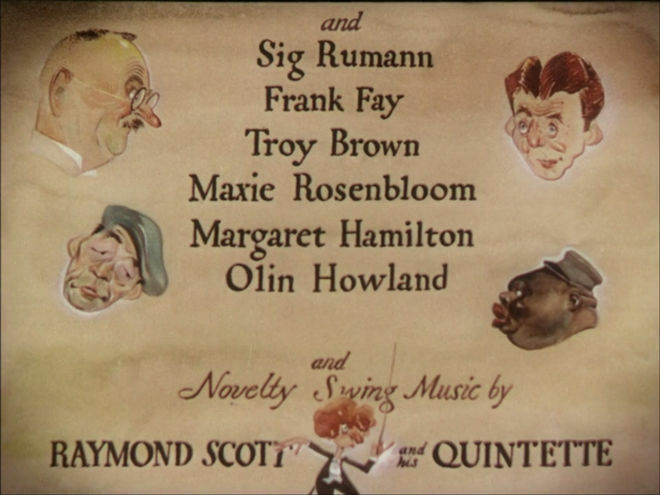 Curiously, Berman’s own credit is unaccompanied by an illustrated figure, which is an unexpectedly appropriate metaphor for the relative lack of coverage on the artist’s career, though he was as much a celebrated caricaturist as contemporaries like Al Hirschfeld. 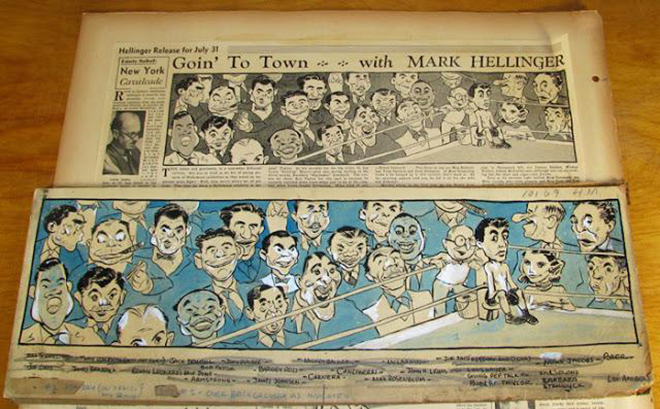 Berman began his career as a newspaper cartoonist, his most notable gig being the go-to illustrator for the popular New York Daily Mirror column “Goin’ to Town” by Mark Hellinger which ran from 1936 to 1937. It was this job that captured the attention of Nothing Sacred producer David O. Selznick, who hired Berman to produce the cartoon doppelgangers of the cast seen in the opening credits. He was also the sculptor behind the one-time mascot of Esquire magazine. 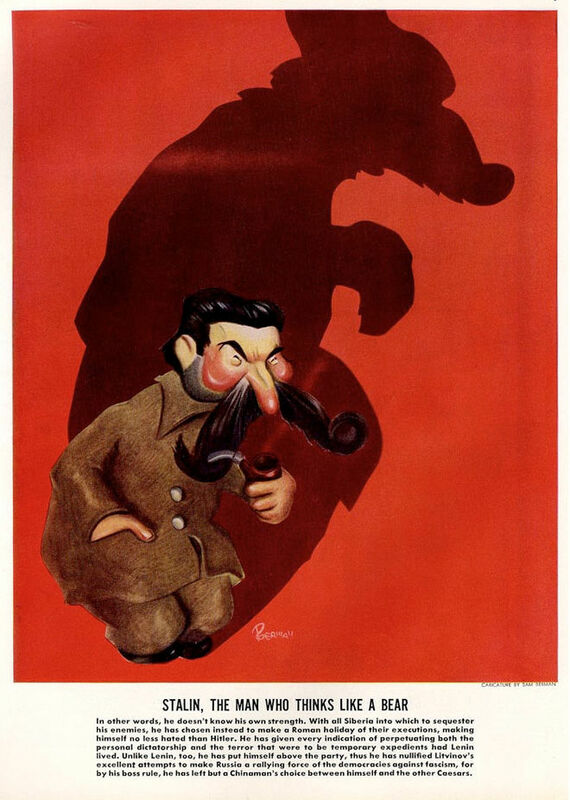 For a year’s worth of covers in 1935, Berman worked in collaboration with illustrator Simms Campbell, to produce sculptures of Esky, a blonde mustachioed dandy shown engaging in a variety of manly pursuits, like hunting, golf, and (of course) flirting with comely women. 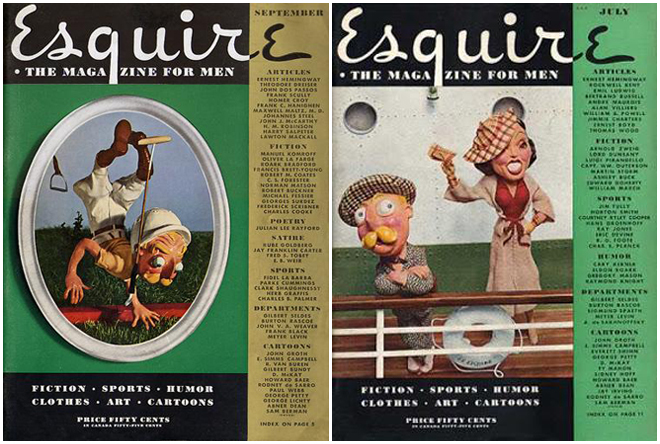 Few clues exist as to the exact process of creating the statues featured in Nothing Sacred, but it can be reasonably assumed that Berman stuck with the same sculpting medium he used for his work with Esquire. In Biographical Sketches of Cartoonists & Illustrators in the Swann Collection, author Sara Duke cites clay as his material of choice: “He originated the medium of clay caricatures photographically reproduced for Life Magazine, and used the same technique to design Esky”. 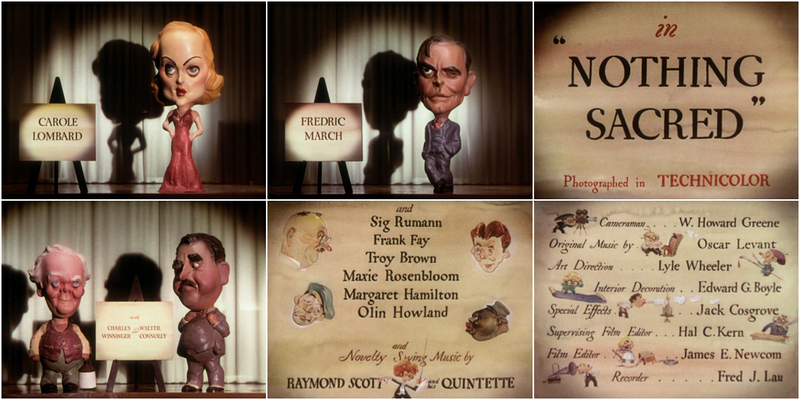 Barney Josephson and Terry Trilling-Josephson’s Café Society: The Wrong Place for the Right People verifies this claim with a quote from children’s book author and illustrator Syd Hoff, “He would make [the Esky sculptures] out of clay”. 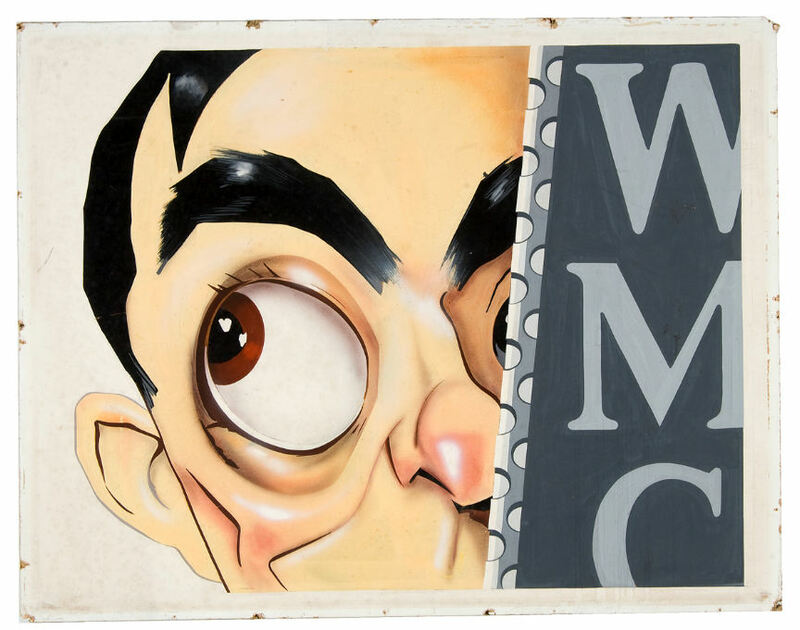 Berman’s popularity as an astute caricaturist of celebrities was buoyed by his work in Nothing Sacred. 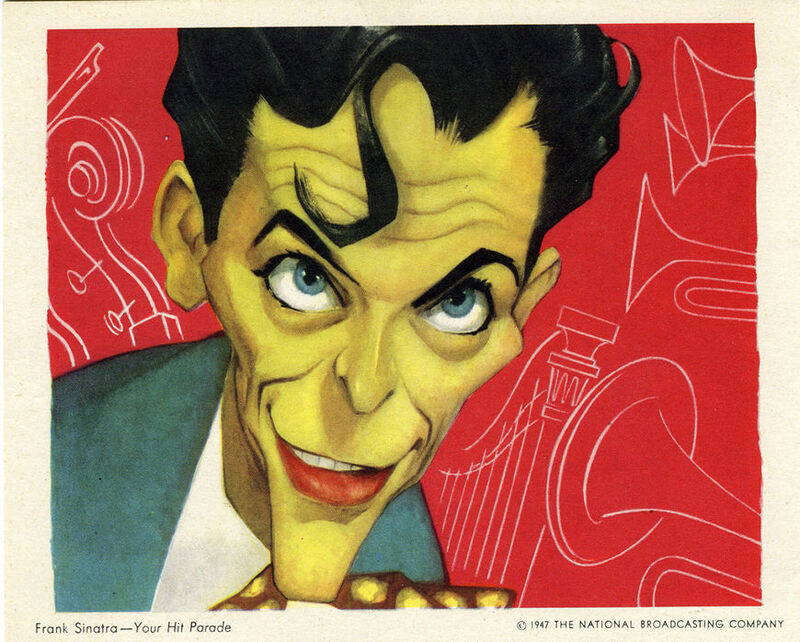 For NBC’s Parade of Stars promo event in 1947, Berman was commissioned to create a series of portraits of the radio network’s best and brightest, George Burns, Gracie Allen, Al Jolson, Eddie Cantor, and Frank Sinatra among them. The illustrations were printed on separate cards and distributed for use in a national ad campaign for the station in newspapers, magazines and on billboards. 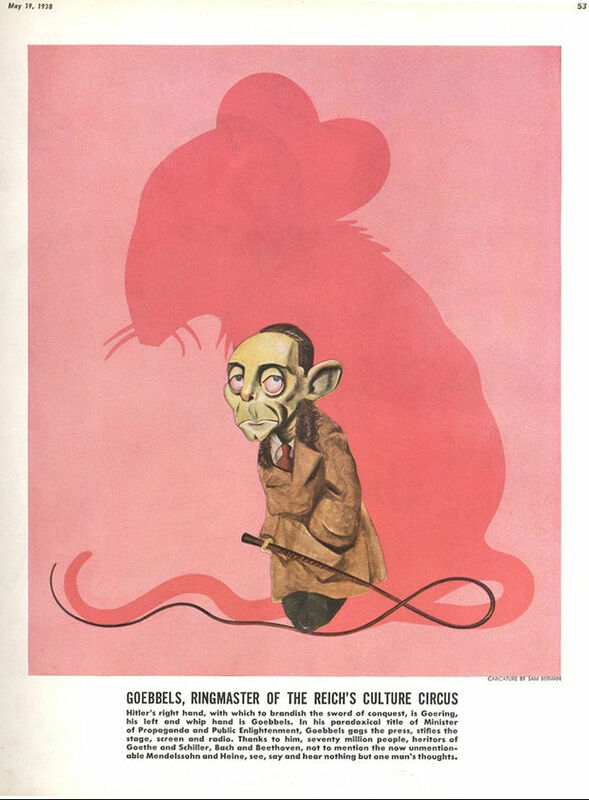 Other notable Berman projects include a series of drawings for Collier’s in 1938, in which dictators and other world leaders are depicted in caricature with their shadows replaced by those of their appropriate animal counterparts (of which Joseph Goebbels as a rat is a highlight). While Nothing Sacred is Sam Berman’s only officially credited role as title designer, cartoonist and Berman-enthusiast Drew Friedman has hypothesized about another. During the opening titles of the 1955 sitcom The Honeymooners, a caricature of Jackie Gleason’s face appears superimposed onto the moon. What The Honeymooners and Nothing Sacred have in common, save for Sam Berman, is an underlying current of possible physical violence. In The Honeymooners it was played as a tease, an empty threat by a bumbling husband (“One of these days, Alice…POW…straight to the moon!”). In Nothing Sacred, it’s the main event. 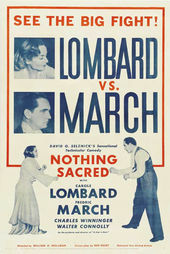 “SEE THE BIG FIGHT!” the posters shout in blazing red block letters, teasing the climactic fist-fight between would-be lovers played by Lombard and March (a finale hinted at in the opening credits by the apparent shiner sported by March’s cartoon doppelganger). Perhaps this is why Sam Berman’s particular expertise was called upon. His signature style, the comically rounded and nearly grotesque exaggeration of his subject’s features, fit with the film’s funny yet uncomfortable depiction of violence between the sexes. 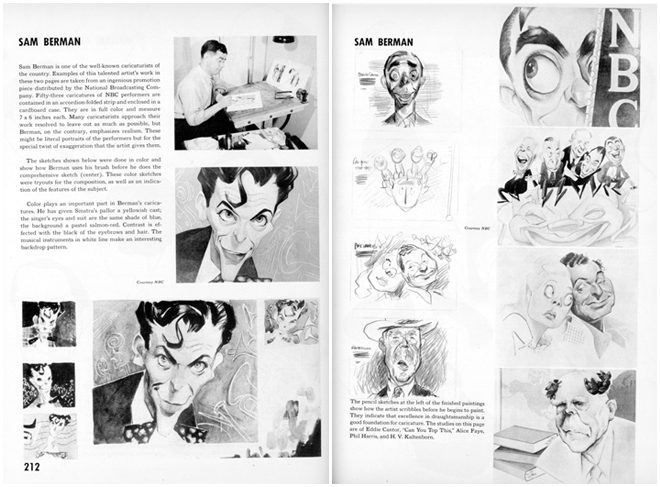 Check out Drew Friedman's excellent post, Sam Berman & the "1947 NBC PARADE OF STARS"